As soon as the Christmas decorations come down in my house, I like to get things moving on to the next holiday. Sure I could try to decorate for "Winter" but I really love red and pink and hearts and all that stuff, so I go straight for Valentine's Day! I have a spot in my kitchen where I always hang a wreath. My front door is a craftsman-type, with windows at the top and a little ledge, so I can never quite figure out hanging a wreath there. I always look for a cute wreath for Valentine's day at the usual places: Target, Hobby Lobby, etc, but I never find the right one. So with all these awesome yarn wreaths I love to drool over on Pinterest, I thought I'd make my own! 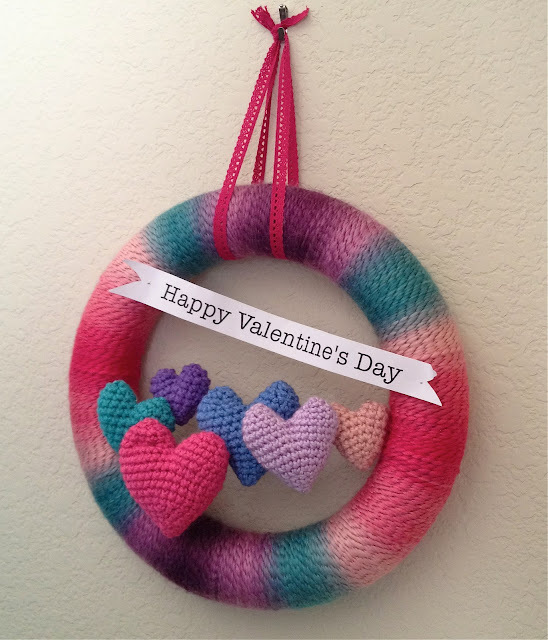 This one is super easy and the heart pattern is fun and quick. 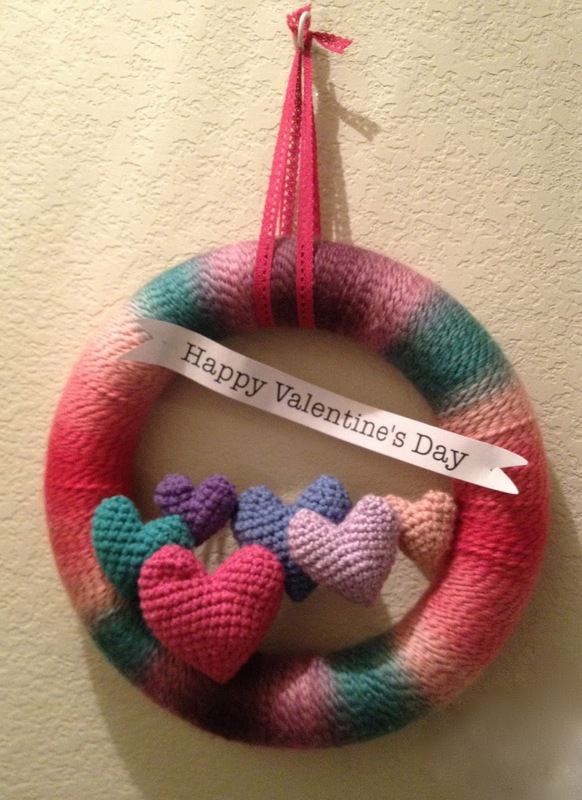 Begin by tying the yarn around the wreath in one spot. Don't worry about hiding the knot, as it will be covered. Wrap the yarn all the way around the wreath, trying to not overlap the strands. This makes the yarn's color changes more even. When you reach the end, cut the yarn leaving a few inches and wrap the tail to the back. Use a crochet hook and pull the tail under a few strands to hide it. R1: Starting at point of heart, make an adjustable ring, ch 1, and sc 3 into the ring. Pull closed. R7: Sc into the next 9 st, skip next 9 st.
*You have now started the right side of the top of the heart. Fasten off by slip stitching into the next stitch. Leave a tail. Using the yarn needle, weave tail through last row of stitches and pull tightly to close the hole. Use a stuffing tool or the eraser end of the pencil to stuff the heart lightly. Attach yarn back onto the open side of the yarn, starting on the inside and you will work around the opening. You can either tie a knot to attach the new yarn or you can insert the hook on the outside into the first stitch and pull the yarn up through the work, and sc for your first stitch. Repeat R7-9 on the other side to create the second top bump. Weave in ends and set aside. R9: Sc into next 12 st, skip next 12 st.
Fasten off by slip stitching into the next stitch. Leave a tail. Using the yarn needle, weave tail through last row of stitches and pull tightly to close the hole. Use a stuffing tool or the eraser end of the pencil to stuff the heart lightly. Attach yarn back onto the open side of the yarn, starting on the inside and you will work around the opening. You can either tie a knot to attach the new yarn or you can insert the hook on the outside into the first stitch and pull the yarn up through the work, and sc for your first stitch. Repeat R9-12 on the other side to create the second top bump. Weave in ends and set aside. R11: Sc into next 15 st, skip next 15 st.
Fasten off by slip stitching into the next stitch. Leave a tail. Using the yarn needle, weave tail through last row of stitches and pull tightly to close the hole. Use a stuffing tool or the eraser end of the pencil to stuff the heart lightly. Attach yarn back onto the open side of the yarn, starting on the inside and you will work around the opening. You can either tie a knot to attach the new yarn or you can insert the hook on the outside into the first stitch and pull the yarn up through the work, and sc for your first stitch. Repeat R11-15 on the other side to create the second top bump. Weave in ends and set aside. R13: Sc into next 18 st, skip next 18 st.
Fasten off by slip stitching into the next stitch. Leave a tail. Using the yarn needle, weave tail through last row of stitches and pull tightly to close the hole. Use a stuffing tool or the eraser end of the pencil to stuff the heart lightly. Attach yarn back onto the open side of the yarn, starting on the inside and you will work around the opening. You can either tie a knot to attach the new yarn or you can insert the hook on the outside into the first stitch and pull the yarn up through the work, and sc for your first stitch. Repeat R13-18 on the other side to create the second top bump. Weave in ends and set aside. You may now begin sewing your hearts together. Arrange them as you would like and stitch them in a line. It's easier to use one color and stitch through all of them across, keeping your stitches hidden, rather than changing yarn colors. The next step is completely optional but I found that it really helped the hearts on my wreath stand up and stay in line. Once you've stitched the hearts together, start at the back on one side and feed a long piece of wire all the way through to the other side. After making it all the way through, insert both ends into the wreath form. In a word processing program, print "Happy Valentine's Day" and trim into a banner. Curl edges and pin to wreath. You are SO sweet to do this!!! Thank you!!!! What a great idea! 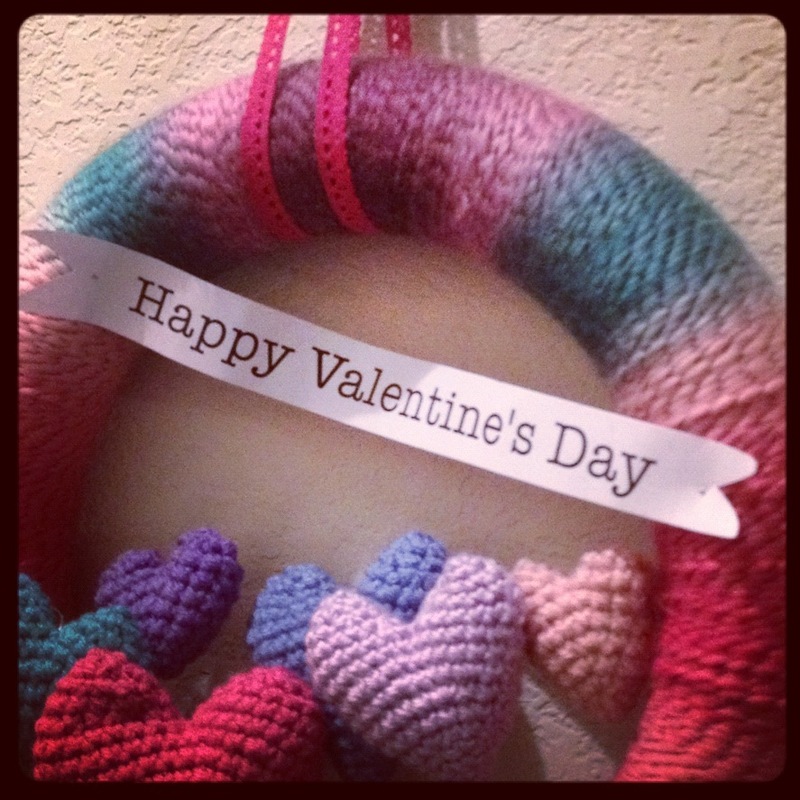 I am always looking for something cute to give hubby for this special day. What a great idea, Cora! Should be a cute gift! How many skeins did it take to wrap the wreath? Just one? I just found this and it's so adorable, I am going to HL today to get my yarn, etc. to make it!! Thank you so much for sharing how you made it.. You are so generous..